Please contact us at info@wrangells.org if you would like more information on hosting a program or school group with the WMC. The Old Hardware Store is the primary headquarters of the Wrangell Mountains Center. The historic building originally served as a general store for boomtown McCarthy during the copper mining period in the early-20th century. Built in 1911 and abandoned in 1938, the structure was placed on the National Register of Historic Places after board member Sally Gibert initiated ongoing stabilization and restoration efforts in 1976. What was once a store, family living quarters, and rooming house is now an active educational center. The space includes a classroom, seminar room, library, program office, workshop, and cooperatively-run kitchen, as well as equipment and food storage areas and residential rooms. The Wrangell Mountains Center expanded to include neighboring Porphyry Place after a successful capital campaign in 2012. 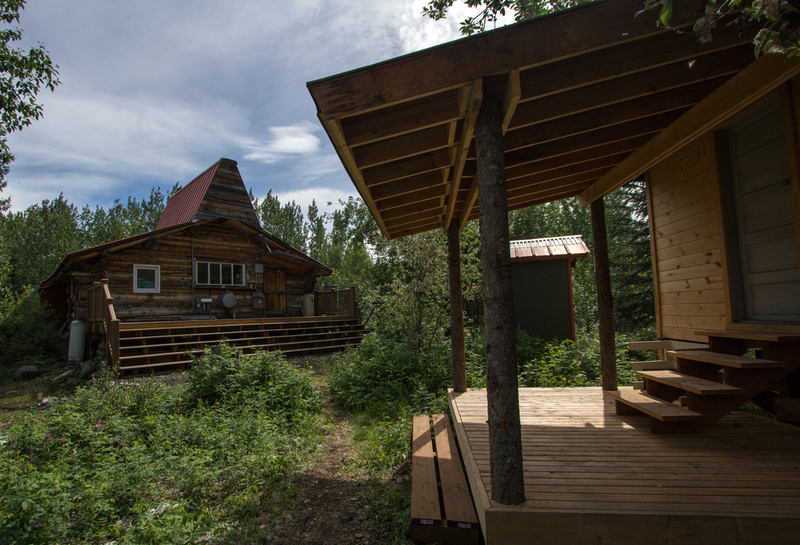 The beautiful cabin offers lecture or concert space, a demonstration kitchen, and study area for visiting scholars. The property also houses our writer and artist-in-residence studios, tool room, workshop, sauna, greenhouse, and some of our gardens. Our expansion into the site enables further growth and program diversity. Our gardens at the Old Hardware Store and Porphyry Place abound with flowers, herbs, and a diverse array of vegetables. The growing season may be short, but the gardens thrive in the summer months, supplying us with many of the greens and vegetables we serve at our programs and events. Check out our blog for garden updates as the season progresses! All the facilities at the WMC McCarthy campus are designed to effectively and economically support a learning community. Program participants from all backgrounds have the opportunity to experience—and contribute to—a largely sustainable living system. We hope to model sustainable living practices in the local area in an effort to raise awareness for conscious choices and minimal resource use.